Published: Feb. 18, 2016 at 11:18 p.m. Updated: Feb. 19, 2016 at 11:55 a.m.
Of the 332 invitees will participate in the 2016 Scouting Combine, the percentages say they played for a team in a major five conference. Two non power conference teams from Utah sent twice as many players some of the biggest names in the college football. Read below to see which big schools and what 40-yard dash times indicate for running backs and wide receivers. Since 2004, 34 Combine quarterbacks have been selected in the first round of the NFL Draft. What does the average first rounder look like? 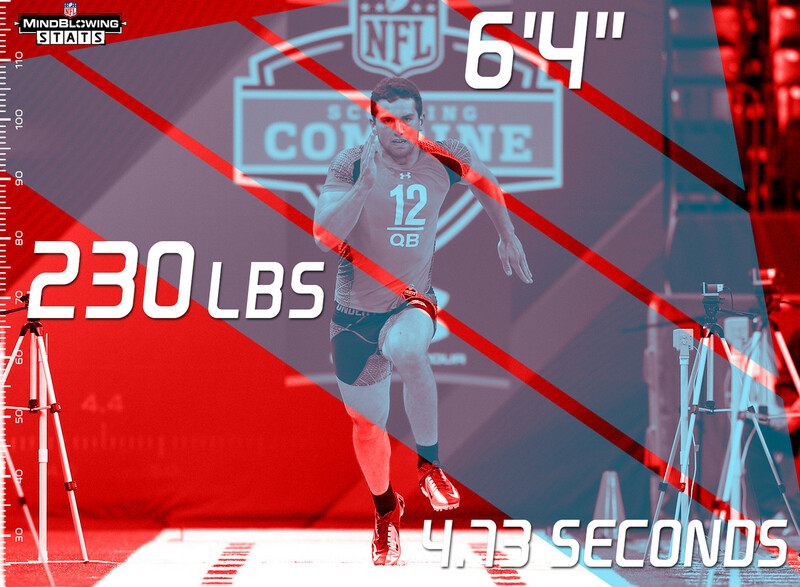 He is 6-foot-4, 230 lbs, and runs the 40-yard dash in 4.73 seconds -- in other words, Andrew Luck (6-foot-4, 234 lbs, 4.67 second 40-yard dash in 2012). For reference, prospective 2016 1st rounder Carson Wentz is listed as 6-foot-5 1/4, 233 lbs. Jared Goff is listed as 6-foot-4, 215 lbs on the Cal website. Paxton Lynch is listed as 6-foot-7, 245 lbs on the Memphis website. Connor Cook is listed as 6-foot-4, 220 lbs on the Michigan State website. 13 of the 18 quarterbacks invited to the 2016 Scouting Combine come from the five major conferences. That includes five quarterbacks from the Big Ten alone -- the most of any conference. The Big Ten quarterbacks are Michigan State's Connor Cook, Penn State's Christian Hackenberg, Ohio State's Cardale Jones, Wisconsin's Joel Stave, and Indiana's Nate Sudfeld. Since 2003, 18 running backs have run the 40-yard dash in 4.40 seconds-or-faster. Of those, seven have recorded at least one 1,000-yard rushing season (Chris Johnson, Darren McFadden, C.J. Spiller, Jamaal Charles, Maurice Jones-Drew, Lamar Miller, and Joseph Addai). In that same span, 53 running backs have run the 40-yard dash in 4.75 seconds-or-slower. Of those, zero have recorded at least one 1,000-yard rushing season. Both Utah State and Southern Utah had as many players invited to the 2016 Scouting Combine (three each) as Michigan (two) and Texas (one) had combined. Among all schools, Ohio State has the most players invited to the 2016 Scouting Combine with 14. This snaps a four-season stretch in which Alabama (2012 & 2014) and Florida State (2013 & 2015) alternated the honor of having the most players invited. Since 1985, when each NFL team began participating in the Combine, only three players have been selected in the first round of the draft without attending the Combine. Cornerback Darrien Gordon (drafted out of Stanford, 22nd overall in 1993 by Chargers) is the last player selected in the first round who was not invited to the Combine. Since 2003, 51 wide receivers have run the 40-yard dash in 4.40 seconds-or-faster. Of those, six have recorded at least one 1,000-yard receiving season: Mike Wallace, DeSean Jackson, Lee Evans, Calvin Johnson, John Brown and Brandin Cooks. In that same span, 138 wide receivers have run the 40-yard dash in 4.60 seconds-or-slower. Of those, seven have recorded a 1,000-yard receiving season: Anquan Boldin, Brandon Lloyd, Hakeem Nicks, Kendall Wright, Michael Clayton, Jarvis Landry, Allen Robinson. Over 20% of the players invited to the 2016 NFL Scouting Combine are from SEC schools. 74 players were invited from the SEC. The conference with the second most players invited to the 2016 combine is the Big Ten with 58 players. Over the past eleven years, NFL Network's Rich Eisen has run the 40-yard dash, with his best time coming in 2014, when he ran a 5.98. Since Rich began running the 40-yard dash in 2005, only one player has finished with a slower time -- undrafted Houston Cougar offensive lineman Isaiah Thompson in 2011 -- who crossed the line in 6.06 seconds.